The traditional carving technique of this type of dolls is called Sasano-Bori, because the dolls are made in the Sasano region in Yonezawa city. "Bori" in Japanese means carving. Sasano-Bori has been handed down from generation to generation for past 1,200 years, and it became well-known to most Japanese people in the 17th century. 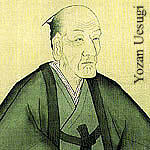 Due to the slow economy in Yonezawa at that time, the then shogunate, Yozan Uesugi, actively promoted the carving industry to improve the economy, which he succeeded in doing. Our craftsman has adopted "Yozan" as the name of his shop. We are proud of Yozan and his achievement, and would like to pass along this little piece of history and introduce to you the traditional carving technique of Sasano-Bori. Brief Introduction of our "Takumi"
Toda Kanpu was born in 1949. He started studying carving at the young age of 11. When he was only a junior high school student, he began making carved dolls of larger sizes. He then decided to take over as the 6th generation Sasano-Bori craftsman. Now he is one of the most famous Sasano-Bori craftsmen in Japan. If you visit his shop, you can see many photos of Mr. Kanpu taken together with celebrities such as Japanese famous actors and actresses, numerous Japanese Prime Ministers, and mayors from cities around the world. Sasano-Bori requires special chisels called Sarukiri and Chijire. 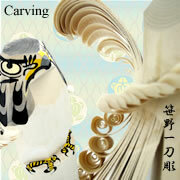 The craftsman uses the axe-like Sarukiri as a knife and makes very detailed carvings on a single piece of wood! Please check out the photos and the video clip below to see how unique this technique is. You will certainly be amazed! Due to the special way in which the wings of the dolls are being carved, wood from two rare types of trees - Koshiabura and Enjyu is being used. The wood of these trees is strong, yet flexible. Both are also auspicious in Japan and China. You can lift these carved dolls by picking up their wings because of their strength. As time progresses, the wood will become more mature and its shade of color will change. These dolls will last for generations to come. The craftman picks up a long peice of uncut wood and puts it on his lap. He then strips the bark from the wood using a Chijire. Because the wood is very dry and strong, this simple task is not as easy as it looks! He cuts and forms the head of the doll (a hawk) using a Sarukiri. Despite the size of the tool, the craftsman controls it with ease. This is the most elegant process. The craftsman peels the wood to make the wings. Not a sound is made, not a single chunk of wood is wasted. He seems to have put life into a piece of wood. He doesn't bend the wood strips to form the wings. The wings bend naturally. After making the side wings, he makes the body. He puts his weight on the Sarukiri to cut into the wood. He peels the wood again to make the tail of the hawk. Then, he cuts off the excess length of the wood and shapes the bottom of the carving. The final task is to paint the doll using traditional colors and design. He paints the eyes, the feather, and the claws. The wings are left unpainted because the moisture from the paint will cause the wood to lose its flexibility. The Sasano-Bori wood-carved dolls make the perfect gift for someone you love and care about, because each one of them is made to order. Your special friends and loved ones will no doubt be glad to receive such a "one-and-only" gift hand-made in Japan. Please also tell your friends about this website and the amazing wood-carving technique of "Sasano-Bori". Every Kanji has its own unique meaning. Every attempt will be made to choose Kanji with good meanings for you. John in Kanji is . Peter in Kanji is . Micheal in Kanji is . Paul in Kanji is . Susan in Kanji is . Jennifer in Kanji is . Anna in Kanji is . Julia in Kanji is . Non-Japanese names and foreign words are normally written in Katakana. John in Katakana is . Peter in Katakana is . Micheal in Katakana is . Paul in Katakana is . Susan in Katakana is . Jennifer in Katakana is . Anna in Katakana is . Julia in Katakana is . Hiragana is a more stylized form of Japanese writing. Hiragana is used more frequently than Kanji and Katakana in Japanese writing. John in Hiragana is . Peter in Hiragana is . Micheal in Hiragana is . Paul in Hiragana is . Susan in Hiragana is . Jennifer in Hiragana is . Anna in Hiragana is . Julia in Hiragana is . In the northern part of Japan, a new born baby is given a Sasano-Bori wood-carved doll. The height of the doll will be equal to the length of the new born baby. What a wonderful gift to celebrate and remember the magic moment of the start of a new life!